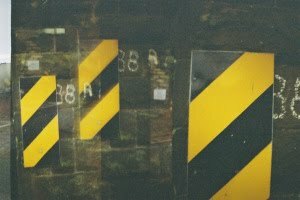 Remember a little while ago I showed you my Smena Symbol camera and starting talking about Lomography? Well since then I've picked up a couple more cameras. The top one is the Diana Mini - which takes normal 35mm film but you can take a half picture -so you get twice as many photos per film. It's pretty small, only about four inches across and very light. The second I call the Panda Cam! It's teeny tiny. The camera is only the middle bit and is about an inch across. The bits on the sides are actually the film sticking out. It takes 110 film like the cameras I had as a kid in the eighties. You can only take outdoor pictures with this though as it has no flash. I've not developed any film from the Panda Cam yet, but here is one from the Diana Mini. Well technically one and a half joined together by chance. so I'm really looking forward to seeing what happens with that. 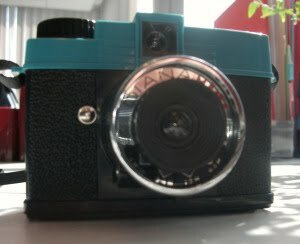 I love lomography! I got myself an Actionsampler while in Japan and it's good fun! Thanks for mentioning the film swap!! Your blog is lovely.